We have been busy doing the ministry work here and many great things have happened in through us. God has used us to become a blessing to many people. The message of God's Grace and Faith Righteousness is liberating many people who are hearing it. Praise God for the work of the Cross. We ended our annual youth camp on Saturday. We had 60 youth attending and many other members of the public. The theme was KINGDOM RELATIONSHIPS. Praise God they went home deeply in love with God. They found the love and acceptance they never thought they will ever get. Praise God for the gift of righteousness.The word clearly tells us that we have been justified by faith therefore we have peace with God! Romans 5:1. I had a wonderful team of preachers and teachers to teach in the camp. Mike and Pat came on Wednesday. They came with their staff members Peter and Stanley. We all spoke the same message. We also had Tony. When FMIN Partner, Janice Moshier, was here in October, she introduced Tony to me. He is a wonderful preacher. He helped us laugh a lot in the evening services, and also prayed for the sick and needy, it was wonderful. By the end of the camp, the campers did skits and songs. I also gave them free Gideons New Testament Bibles and they cried over the shoulders and they gave each other hugs of love. They all got a wonderful revelation of God's love and acceptance and that's how to deal with others in order to have wonderful relationships. Tony and Joseph from Meru North, brought 7 youth and they all went home freed from fears, tradational beliefs and fear and they were filled with the Holy Spirit. Many testimonies were given even in the church yesterday. God healed even Toothaches!!! Hallelujah. FMIN is a blessing. NEVER STOP PREACHING Faith Righteousness and God's Grace!!! It is the GOSPEL. 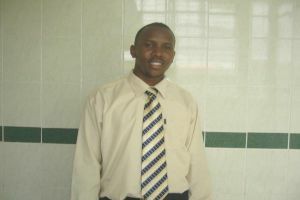 David is the son of FMIN Partner, Margaret Remi Thomas. His father (who is now in heaven) was a dear friend of Dave Duell, whom David was named after. We are so proud of you, David! You have an amazing revelation of the Good News Message and you're willing to share it with everyone.